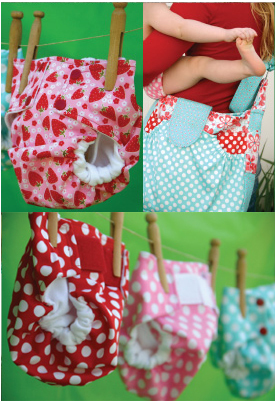 Following on from my popular post about the fabric possibilities for dribble bibs I thought it would be a good idea to run a series of these posts to talk about the other more specialist fabrics we stock in the Plush Addict Shop. We get lots of questions about which is the best waterproof fabric to use for a particular type of garment or handmade item so I figured this would be the next one in line for a bit of (hopefully!) helpful blurb. PUL is a bit of a special kind of waterproof fabric as it has the marvellous magic properties of being waterproof, but breathable. So why is this important? Well it’s very special because it means you can make waterproof items of clothing and cloth nappies and your body heat has a better chance of escaping in to the atmosphere through fabric so you sweat less! Brilliant. Composition: PUL has 2 sides to it, one side is made from a polyester knit which means it has a slight stretch which is great for clothing as you get a bit of “give”, important when you’re moving around as there’s less chance of a seam giving way under stress. One side of the polyester knit has a laminate coating applied so it’s slippery and shiny; this is the waterproof layer. PUL is a soft flexible fabric which doesn’t really crease and it air dries in super quick time and it doesn’t fray when cut. The PULs we stock contain no lead, phlalates or BPAs so are suitable for products intended for children under 12. Right or wrong side? : I often get asked if there’s a right or wrong side to PUL and as far as the “waterproof-ness” goes there isn’t really, you can have either side as the right side and it will work just the same. That said, for aesthetic and comfort reasons the knit side is often used as the “right” side as it usually has a pretty pattern or colour and as the laminate side is shiny it’s probably more comfortable to have this away from the skin or it’d be a bit sticky. You can line your garment of course which will over come this, and cloth nappies usually have an inner fabric which is closest to the skin, or PUL is often used as a shaped wrap which goes around a fitted nappy which has no waterproof layer of it’s own. In pocket cloth nappies the shiny side is often used as the “right” side simply because it makes stuffing the nappy easier. What is Sandwich PUL? As well as single layer PUL we also stock sandwich PUL which works in the same way but instead of being composed of 2 layers of fabric there are 3 layers. The layer of laminate is sandwiched in between 2 layers knit fabric. This is especially helpful if you don’t want to have the shiny laminate side against the skin as it’s hidden away between the knit layers. It’s also stronger so if you are applying a kind of fastener such as KAM snaps, extra reinforcement isn’t required around the fastenings. Uses: Cloth nappies and wraps, anoraks, waterproof trousers, wet bags, swim bags, changing mats, changing bags, mattress protectors, pillow protectors, baby bibs, picnic blankets, incontinence products, anywhere you need a waterproof, breathable layer. Laminated cotton isn’t completely waterproof, but more water resistant so it’s probably not the best choice for a cloth nappy or for something like a wet bag. People lean towards laminated cotton when they’d like to have a natural fibre on one side of the laminated fabric, it’s also thinner and more pliable than PUL. Because it’s a natural fibre that’s BPA free it’s also considered safe to use for foody makes such as lunch bags and sandwich pouches. Composition: Laminated cotton is another 2 layer fabric where a high quality 100% cotton sheeting has a film of laminate applied to the right side of the fabric. This fabric has much less of a stretch than PUL and is favoured when you’d like a natural fibre as part of your garment rather than polyester. It doesn’t fray when cut. 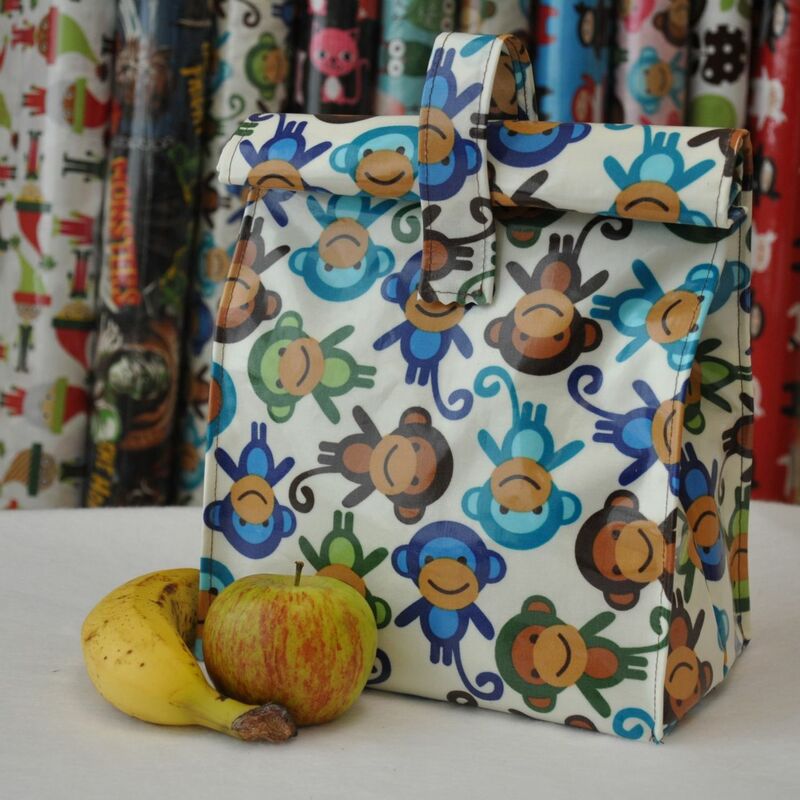 It’s PVC-free, and BPA-free and as such is often a fabric of choice when making items for under 12s or food related. It’s pretty and pliable with a nice hand and drapes well, making it ideal for garments and a plethora of other fabulous items. Right or wrong side? : The laminate is applied to the right side of the fabric, this means that the wrong side is 100% cotton and so can be comfortably worn against the skin. 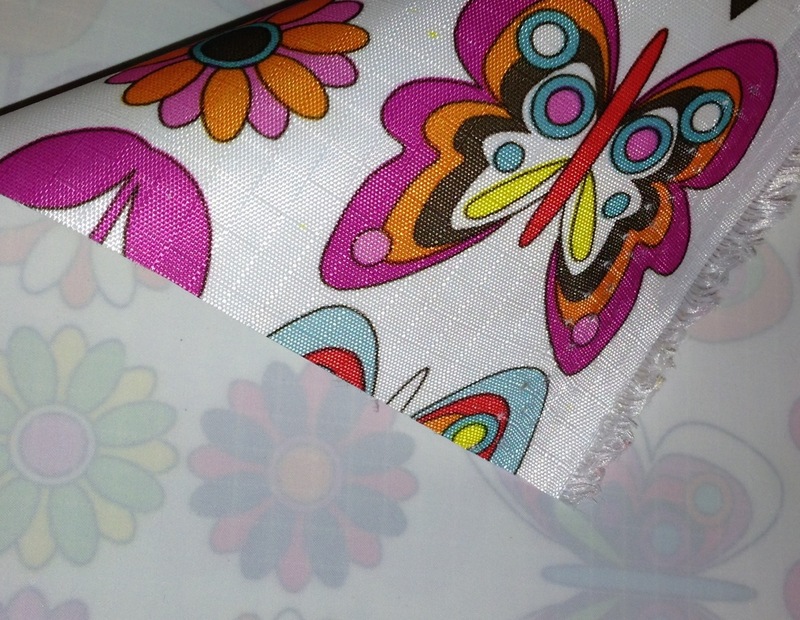 Uses: Laminated cotton has a lovely hand and is perfect for use in children’s wear, rain coats, bags, baby bibs, play mats, changing bags, place mats, table cloths, sandwich bags, lunch bags, craft aprons, purses, pencil cases. Ripstop is the real rufty-tufty of waterproof fabrics that we stock. It’s a nylon threaded material that is pretty resistant to tearing or ripping. It’s so tough and strong it’s used a lot in camping equipment such as tents but it’s also used in things like hang glider wings and hot air balloons… not that I imagine you’ll be making your own hang glider any time soon but it shouldn’t be disregarded as it’s also useful for smaller scale applications around the home and is especially good for the garden and it’s much more economical to buy than some of the other waterproof fabrics. I use it as an under high chair cover to save my floor from toddler food accidents and I didn’t even hem it <gasp!>. Because it’s so durable it’s great for outdoor applications and would make great covers for outdoor furniture or perhaps a BBQ. Bear in mind ripstop isn’t completely waterproof, it’s better than laminated cotton but if wet items are left sitting on it for a long period the wet will seep through. It’s for this reason I think PUL or ProCare are a better choice for wet bags, but for short term wet applications like a swimming bag that just houses soggy togs for a few hours I think it’d be fine. It can be used in clothing but bear in mind it isn’t breathable. Composition : Ripstop is made by weaving nylon threads together through a base material. It has an interlocking weave which gives it a distinct raised box pattern on the fabric and it’s because of this weave that it’s difficult to tear. It’s not a breathable fabric and it doesn’t have any stretch. It doesn’t really fray when cut. It’s a bit noisier than some of the other fabrics in this genre and has that familiar rustle sound! Right or wrong side? : the patterned side is the right side, this is for aesthetic rather than performance reasons. Uses: Boot bags, wet bags (although I believe PUL or ProCare perform much better for this application), rain coats, waterproof trousers, ruck sacks, wash bags, pencil cases, kites, wind breaks, shower curtains, splash mats, table cloths, peg bags, tote bags, changing bags, outdoor bunting, outdoor furniture covering, nappy wallets. Once upon a time oil cloth was actually a closely woven cotton cloth covered in boiled linseed oil to give it waterproof properties, times have changed and things are a little less messy with today’s oil cloth. Composition: Oil Cloth is a PVC product and is 100% vinyl and is completely waterproof. It’s very shiny, durable and quite thick so isn’t as pliable and easy to work with as some of the other fabrics in the category. It doesn’t fray when cut. As oil cloth contains phthalates it isn’t intended for projects for children under 12. Uses: Table cloths and protectors, bags, pencil cases, book covers, aprons, coin purses, place mats, floor mats, totes, drawer liners, place mats, garden caddies. ProCare is a very durable totally waterproof barrier fabric. It’s more of a functional fabric than one that will add some pretty cheer to your makes but it does have a few special properties. It has a really high laundry tolerance, over 300+ washes the manufacturers claim. It’s also food safe making a great choice for lining a lunch bag or sandwich wrap. ProCare also meets duty, laundering and material safety standards for use in medical and institutional products. ProCare is not breathable. Composition: ProCare is 25% polyester and 75% vinyl. It has no real stretch and does not shrink. It can be seam welded with an impulse sealer. It’s free of lead, phthalates, BPS or brominates and is FDA GRAS compliant for contact with foods. Right or wrong side? : One side has more texture than the other but both are quite similar. There is no functional difference when using either side of the fabric. Phew! That is rather a lot to digest but I hope you found it helpful. I’m planning on writing a sewing tips series at some point soon so watch out for some tips on handling these more specialist fabrics too. Brilliant! Thank you so much for this great information!! Wow that was so very helpful . Thank you very much . I have been using the laminated cotton to make hand bags and found that it sticks to the machine like glue. To stop this happening I wiped over the machine bed with a thin layer of machine oil, Hope others find this useful. Thank you so much for this clarity on waterproof fabric. Really helpful indeed! I make 100% bamboo fleece breast pad and was thinking of adding PUL fabric between the 2layers of fleece. Has anyone used aquis towel fabric, or similar high absorbant, quick dry towel fabrics for pantiliners? I’m interested in how this might have turned out, because I’d like to make my own, washable versions. ( The joys of getting older!) Any other suggestions would be greatly appreciated as well. Your post is very informative. I didn’t realize that waterproof fabrics have different types. Hi – I’m wanting to make a tablecloth to protect our new wood table from my kids, especially my 3 yr old who knock her water glass over once a week or so. I’ am considering PUL vs laminated cotton rs ripstop. Do you have any thoughts? PUL seems good because it is waterproof and breathable, but my understanding is it isn’t considered food safe and also if I put the PUL side down, the top would still take a while to dry (but PUL side up would look weird and maybe get damaged). Laminated cotton sounds like it might not be waterproof enough, and ripstop might not be breathable enough? I would love to hear your opinion. Thanks! I’m not sure it matters much if a table cloth is breathable, it’s more important for clothing. DiaperMaker PUL is tested for food safety. I don’t have the Certs to hand but Wazoodle (in the US and who manufactures it) has them. Hope that helps! Hi, thanks so much for this. I am considering making my own simple chest waders. Any fabric recommendations? Thanks! Hi, thanks for the brilliant information. What is the advantage of being able to seal the seams over just being able to close the sewing holes using the tumble dryer (looking at your own brand PUL vs the other PUL)? Does closing the sewing holes using the tumble dryer not make them completely waterproof again? Thanks! Thanks for the useful reply. 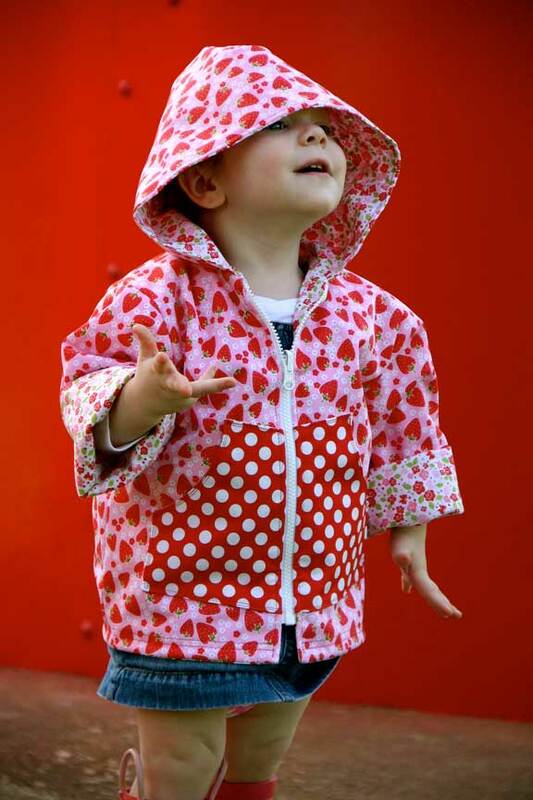 I’m considering an anorak, but still very much in the “thinking about” stage at the moment. I guess if I used the coloured PUL and felt that it wasn’t waterproof enough I could use waterproofing on the seams (like that stuff for re-waterproofing tent seams)? If it were me I’d use the coloured PUL for an anorak as it’s thinner and more flexible and the drape would be better. I’m sure a blast in the tumble would seal the seams ok and if you did run in to issues then, as you say, seam tape could be applied once it’s sewn up. Good luck and let me know how you get on! Thanks ever so much for your help and tips – I will do! Thanks for the info. Which waterproof fabric would have a matte finish or at least not too shiny? Hi thank you so much for the information it’s really useful. I would like to make a warm raincoat lined with fleece or something similar. what would be the best waterproof fabric to use with it? That’s an awesome reference. You just saved me tons of time. Thanks. HI – Still trying to find a source for buying ProCare fabric – any suggestions as to where I would find some? We will be restocking it at some point but I’m afraid I don’t have a date right now. Buying direct from Wazoodle is probably your best bet. I’d like to use a reusable fabric bag to freeze food items in my freezer at home. Are any of these fabrics safe to freeze? I’d say you should be looking for food safe fabrics, ProCare is food safe. Can’t say I’ve ever put it in the freezer though so you’d need to test it. We don’t have stock presently but it’s available from the US from the manufacturer Wazoodle. Thank you for such an informative guide! It’s so confusing with the vast amount of different kinds of fabrics out there. Just wondering if you have heard of parker nylon. Is that the same as ripstop nylon or is it made of polyester? I’m looking at making change mats for sale online and I’m wondering what would be the best fabric to invest in. Would appreciate any recommendations you might have.